A bird is sitting in a 35 metre tall tree looking down at a worm on the ground. If the angle of depression from the bird to the ground is 55∘ 55^\circ 55∘, how far is the bird from the worm? Standing on the balcony of an building A, the angle of elevation to the top of the building B across the street is 47∘47^\circ 47∘, and the angle of depression to the bottom of the building B is 58∘. 58^\circ.58∘. If the buildings are 42 metres apart, find the height of the building B across the street. 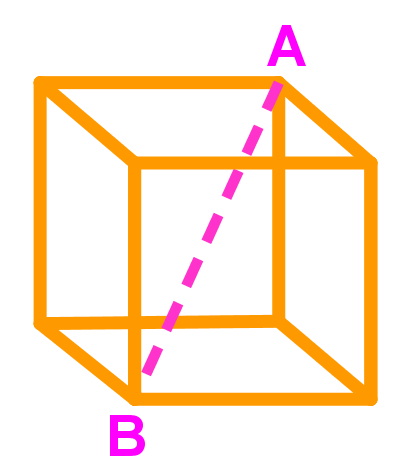 If the volume of the cube below is 512 cm3cm^3cm3, what is the length of AB?